I needed another quick, cheap dinner tonight. Calamari is $6 a pound at Wholefoods, and I only bought a little more than a third of a pound, which was plenty. I sliced the tubes thinly, and cut the tentacle parts in half. This made enough for Alex and I to eat for dinner. I served the calamari with marinara sauce that I had in the freezer, but they would be just as good with a squeeze of lemon. 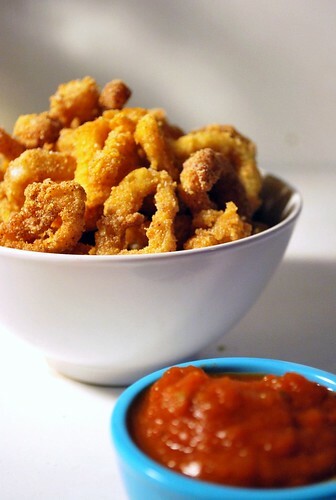 Slice your calamari tubes into slices about 1/3" thick, across the tubes so you make rings. Cut the tentacle parts in half. Combine the rice flour, cornmeal, salt and paprika in a ziplock bag. Zip closed and toss to mix. Beat the egg with the milk. Dip the calamari parts into the egg, then drop them in batches into the bag, seal, and shake. 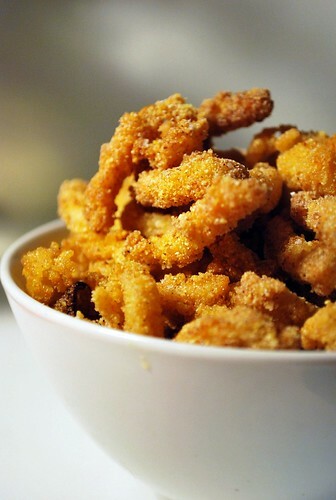 Repeat until all calamari is coated. 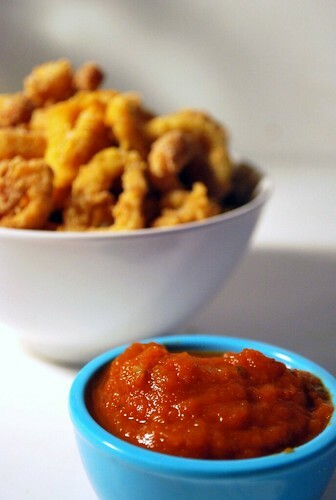 Heat the oil until a bit of flour dropped in sizzles, then fry the calamari until lightly browned. It will only take a minute or so. Sprinkle with salt when they're still hot. Serve with marinara sauce, I used the sofrito sauce from the risotto. YUM. Have you ever had seared calamari? To die for! Oh, this looks wonderful with all those beautiful roasted vegetables! I can't wait to try it! Wow, that looks better than the ones we order at restaurants. I never thought to try making it myself at home. No lie my kiddos are crazy for this and will bicker endlessly if I don't count out equal portions for the three of them. After two weeks at the beach, my GF son and I were really missing our calamari. The rest of the family refrained from ordering it, so they were missing it, too. Made this with frozen calamari. It was fantastic. Thanks so much! I will use the same breading with chicken one of these days.